I am happy and exited to invite you to the Sunday Party in the location of Protected content in Rome. The party will end with a delicious vegetarian and sanctified dinner. 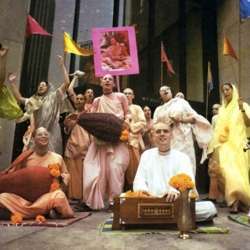 16,45 -We will chant and dance together the holy mantra "Hare Krishna, Hare Krishna, Krishna Krishna, Hare Hare, Hare Rama, Hare Rama, Rama Rama, Hare Hare" with some Indian classical instuments of percussions and harmonium. - Explanation of the essence of the holy book "The Bhagavat Gita"
The Hare Krishna mantra, also referred to reverentially as the Maha Mantra ("Great Mantra"), is a 16-word mantra, composed of two Sanskrit names of the Supreme Being, "Krishna," and "Rama. Queste tre parole, Hare, Krishna e Rama, sono il seme trascendentale del maha-mantra.